It's a common misconception that we have the right to roam anywhere we like in the countryside. The 2000 Countryside and Rights of Way Act give us the right to walk freely on certain designated areas or 'open access' land. Even then there are some restrictions. The good news is that the country is covered by a network of footpaths. These are often unsurfaced and cross fields, but the landowners and local authorities have duties to make sure that they remain passable. There are several different types of path; public footpaths, bridleways, 'Byways Open to All Traffic' ('BOATs'). They have different rules, but all are open to walkers. A black dotted line denotes a path that has been identified by Ordnance Survey, but not necessarily a right of way because the status is not defined or known.Generally, there are gates and stiles where the path goes in or out of a field or through a hedge. There will often be a disc with an arrow showing you the general direction of the path, but the only way to be sure that you stay on the right of way, is to use a map. 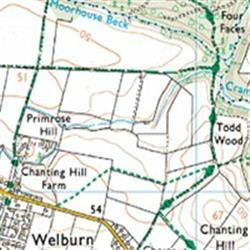 Ordnance Survey maps show these paths as green dotted lines (or pink dotted lines on electronic maps). Creating a circular or linear walk is as simple as 'joining up the dots'! Reading a map is easier than you think. It is simply a drawing of what's around you, looking down from above. Not unlike a satellite image; Ordinance Survey maps have a key, detailing the all the symbols and their meaning. The date your map was last revised, can be found in the General Section of the key (usually at the top). If you know where you are on the map, and which direction you're facing, then you should see the footpaths and landmarks near you, thereby, helping you confirm and plan the rest of your route. However, the devil is in the detail; it is easy to become disorientated, so check and check again. You may know which road or path you're on, either because you know which path you started on and you haven't turned off it, or because you've been following the map as you've walked. If so, then you simply have to look for obvious features on the map and those around you and match them up. Have you just used a bridge over a river? Have you just passed a church? Find it on the map and you'll know exactly where you are. If you don't know which path you're on, or are unsure, then you have a little more work to do, but the principle is the same. You'll know roughly where you are because you know where you started and you know how far you've travelled and in which direction. Unless you're in a very remote spot, then there'll be lots of clues. Don’t be reluctant to ask people for help/ directions. The's no shame in turning the map around so the top of the map is facing north. If you can do this in your head, then fine, but there's no reason not to twist it around. Easy f you have a compass - The red needle on the compass points North - just make the top of the map face north too, and line up the blue vertical grid lines with the compass needle. If you don't have a compass, use the sun as a very rough guide; your shadow will be pointing very roughly north at lunchtime. Failing all else, use features on the landscape to help you. 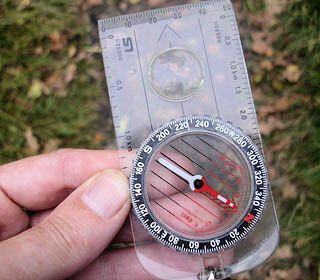 If you've used a compass to orientate the map, then you'll already know which way you're facing. If you've worked out where you are and where you want to go, then all you need to do is work out what direction you need to walk in, face that way and walk!